5 Golds, 4 Silvers and 3 Bronzes!!! 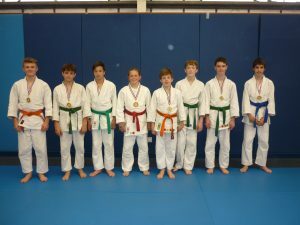 – Well done to all those who took part in the Bushido Junior Nationals!! 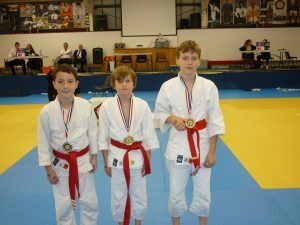 Three young fighters from the Bath Judo Club attended the Bushido Za Zen Pre Junior national championships at the High Wycombe Judo Centre and returned with two gold medals and a silver medal. The first competitor to fight was Arni Trevethick who in his group of players completely dominated the under 30 kilo class. His three fights did not last the contest time as he produced brilliant throwing techniques to completely dominate these contests. Jasper Trevethick the brother of Arni was the next player out and he produced some dynamic judo techniques to completely outwit all his opponents to take the gold medal in the under 35 kilo group.. His club mate Matthew McKeever on his first outing for the club then went on to win the silver medal in this group The spectators were very impressed with his throwing skills which were fast and clinical. The first weight group was the under 45kg, Wilbur Riddoch produced some brilliant throwing techniques to take the silver medal whilst Felix Trevethick took the bronze. The next group the under 50 kilo saw an outstanding display by Jack Hine who convincingly beat all his opponents to take the gold medal, his club mates Daniel Zukas and Vallen Oliver took the silver and bronze medals showing the Bath club convincingly winning this section. Not to be out done the next section the under 55 kilo’s was won by Markos Constantinides with Joe Peabody taking the silver medal and club mate Natham Stokes coming in at fifth place. The under 60 kilo group only had one Bath player contesting this group Joshua Richter who won the gold medal and produced the throws of the day.day beating all opposition with superb throwing techniques. In the girls section Eliza Davies from Monkton Combe prep school representing the Bath club on her first ever competitive outing showed great courage to win two of her contests to take the bronze medal in the girls under 52 kilo category.